When planning on getting your data into the cloud as a part of an application migration or a data center shutdown, you will run into the hard limits of data transport. When your Internet speeds are not enough to keep up with your data migration plan, it’s time to consider AWS Snowball. The Snowball appliance allows you to move archives, data lakes, and whatever data you have at faster-than Internet speeds right into Amazon S3 buckets. From Amazon S3, data can be archived into Glacier or analyzed by other services such as AWS Redshift or EMR. This implementation guide will get you started with AWS Snowball's quick, simple, and secure process for migrating large amounts of data into AWS. Create a data import job using the AWS Console. Afterwards, AWS will prepare and ship a Snowball appliance to the address you specified. Transfer your data onto the Snowball using the client. Then ship the Snowball back to AWS. The integrated E-Ink label on the Snowball makes this easy for you by automatically updating with the return address. There is no packaging necessary, as the Snowball is its own shipping container. 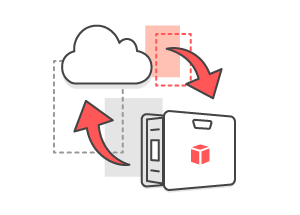 See your data securely imported into the cloud and stored in Amazon S3. 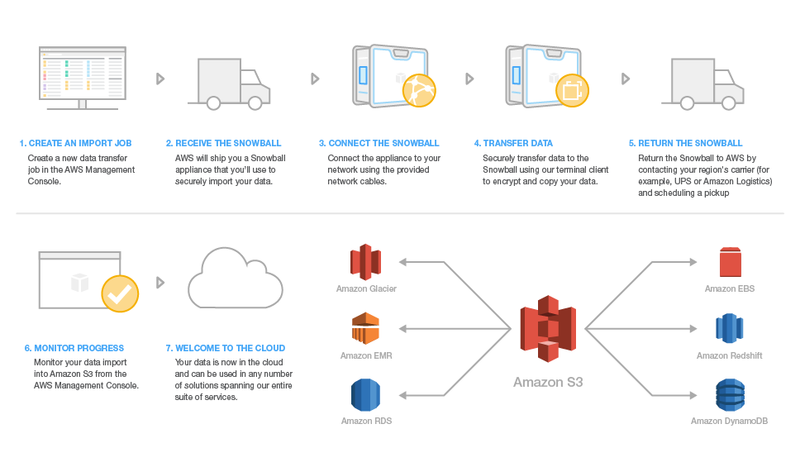 When we receive the Snowball from you, we will import your data into Amazon S3 buckets. After the import is completed, the appliance is erased for your protection in accordance with NIST media sanitation standards. Lots of data: Snowball is designed for large-scale data transfers. To keep things cost-efficient, we recommend using Snowball if you have at least 12 TB of data you would like to move to the cloud. An AWS Account: You will need an AWS account to begin provisioning Amazon S3 buckets to store your data and to request a Snowball appliance. Sign up for AWS. An AWS IAM User: Set up an AWS Identity and Access Mangement (IAM) User to access Snowball. See Create an IAM User for more information. IT Skill level: You will need a basic understanding of storage and networking technologies and familiarity with the command line interface for Linux, Mac, or Windows. AWS Experience: No previous experience with AWS is needed to follow this guide. The total cost of moving your data into AWS will vary depending on the amount. There is a service charge of $250 for the appliance and an overage penalty of $15/day if you keep it for more than 10 days. Data transfers into Amazon S3 are free. Shipping charges are based on your location and your carrier. Work with industry-leading tools and experts who can help you transfer large amounts of data into Amazon S3 buckets at faster-than Internet speeds. Need more resources to get started with AWS? Visit the Getting Started Resources Center to learn more.